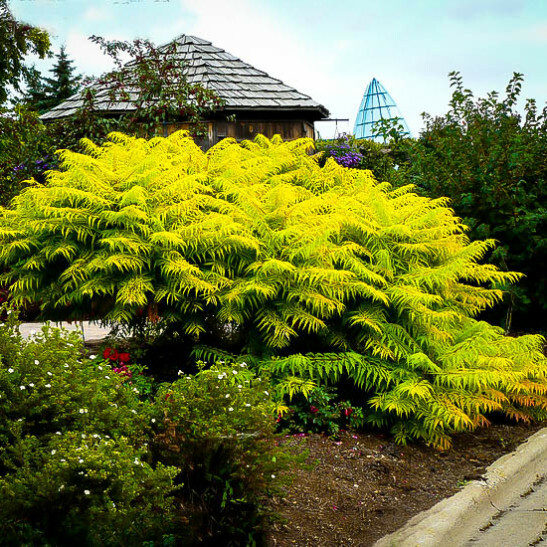 The Tiger Eyes Sumac is a bright, eye-catching shrub that grows up to 6 feet tall and as much across. It has dramatic, bold, deeply divided leaves that are chartreuse green in spring, bright yellow in summer and orange and scarlet in fall, making a constant changing color display in any garden. It makes a great background shrub in large beds or for bringing drama to those boring areas of your garden. This shrub will grow in any kind of soil that is well-drained and it also thrives in stony and rocky soil. This is a great plant for a cottage or anywhere you want natural styles of planting, but it also looks great in more organized larger gardens too. 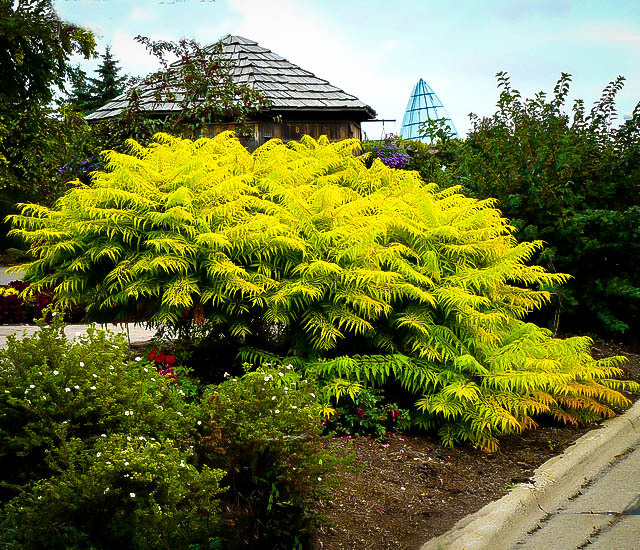 Once established the Tiger Eyes Sumac is drought-resistant and takes care of itself, so use it for those awkward parts of your garden that need a real color-lift. Take some time in the first year or two to keep your plant well-watered until they are established, and then it will be hardy and need no further care. You will be amazed at how good this plant will look in so many seasons of the year, for so little input from you. For low-maintenance gardening, it is important to use ‘no-nonsense’ plants that will just grow happily in many different conditions and fill spaces behind your more important plants, without adding to the care needed in your garden. This is especially important in larger gardens where there are bigger spaces to fill, and where sturdy plants that will take care of themselves are a great asset. 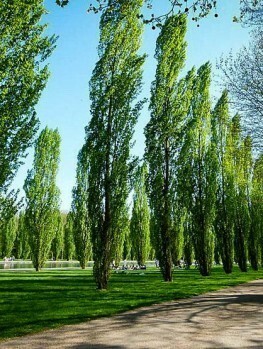 Once these kinds of plants were pretty boring – just green and nothing much to look at – but that is true no more. 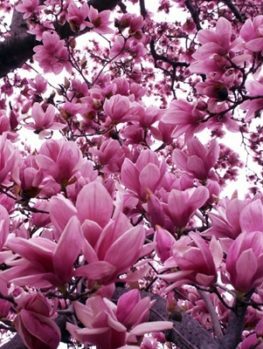 Today there are exciting, colorful and beautiful plants that also need minimal care and will spread to fill spaces in the garden with really worthwhile effects. One of the best of these new ‘high interest/low maintenance’ plants is the Tiger Eyes Sumac. Many gardeners will be familiar with regular Sumac, a native plant known for brilliant fall color, but the Tiger Eyes Sumac is so superior it might as well be another plant. 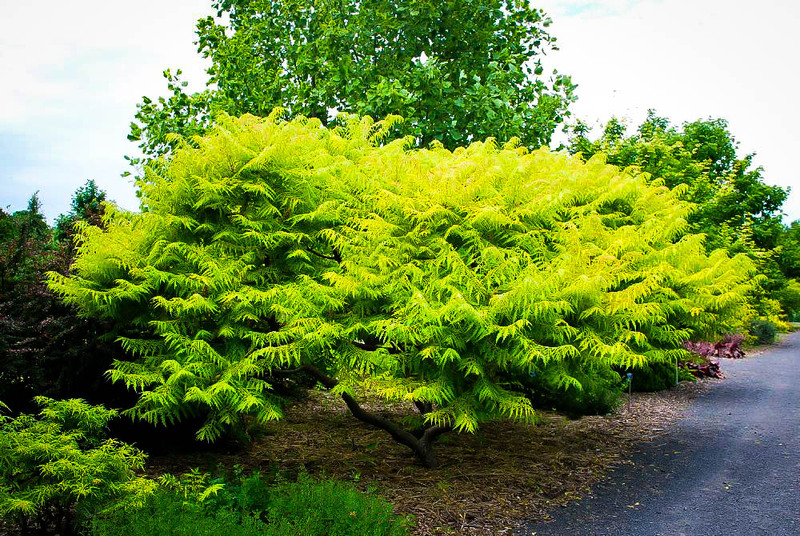 It has large, deeply divided leaves almost like a giant Fern, which are colored a delicious shade of chartreuse green when they open in spring and then turn a bold yellow for the summer, before adding scarlet and orange tones in fall. 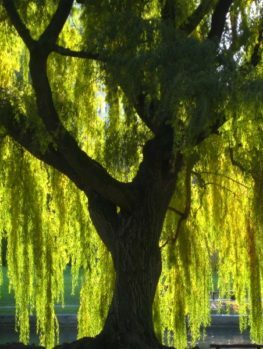 This tree makes a brilliant backdrop for any plants in your garden, and really brightens up a shady corner. The reddish stems are fuzzy when young and become smooth and more tan-colored as they become older. They make a bold contrast with the leaves. On older branches clusters of tiny flowers turn into fuzzy red spikes in fall and add to the show. 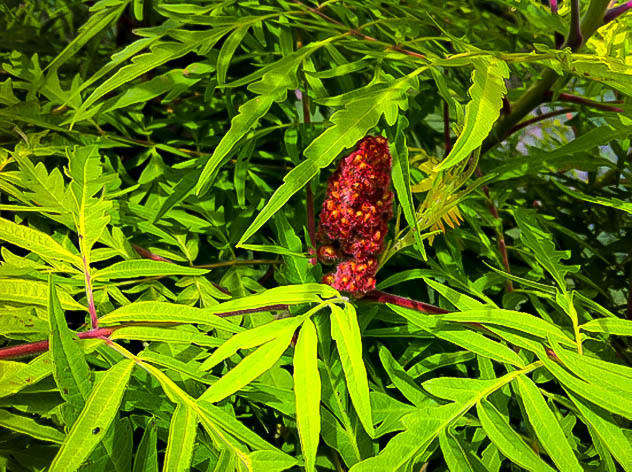 Plant the Tiger Eyes Sumac in a sunny or partially-shaded location in any soil that is not badly drained. Once established it is drought resistant and even thrives in drier soils, but new plants should be kept well-watered until they are established. 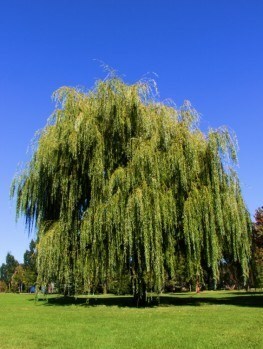 In sunny spots it will grow up to 6 feet tall, and a foot or two less in more shaded locations. Allow room for the plant to spread into a clump, but it will not spread and become a problem as the common sumac is known to do. 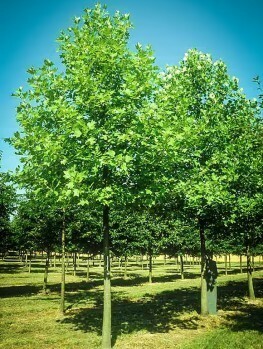 It is resistant to rabbits and is a good choice for planting under a Black Walnut tree, where other plants will not thrive. The wild Sumac (Rhus typhina) is also known as Stag’s-Horn Sumac, referring to the appearance of the foliage, which is bold and held-out from the stems, with many segments sloping away from a central stem. The word ‘typhina’ means antlers. 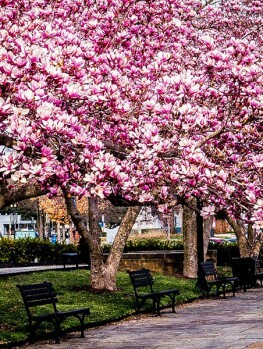 It grows throughout the north-east, from Canada down to the Appalachian Mountains and South Carolina. It also grows west below the Great Lakes to Iowa. It is usually seen growing on the edges of forests, on dry and rocky soil and along river banks. The Sumac was introduced into Europe in the early 17th century and is popular there too as a garden plant. A much more ornamental form, called ‘Dissecta’ or ‘Lacininata’ was discovered at the end of the 19th century by a nurseryman from Reading, Massachusetts, called J. W. Manning. This variety is almost always grown in gardens rather than the wild form, as it has much more attractive, deeply lobed and dissected leaves with excellent fall color. In July of 1985 a unique plant was discovered in the grounds of Bailey Nurseries, here in the USA. There, growing among some dissected-leaf sumac, was a plant of a unique yellow color, which they called Tiger Eyes, and later patented. Because this name is protected, you are guaranteed that this plant is indeed the correct and justly-famous Tiger Eyes Sumac. Cheaper seedling plants that are available from other nurseries will not have its notable features, so avoid them and choose the named plant. Although this plant does not spread as the wild Sumac does, it should still be planted towards the back of a larger garden and not planted in very small spaces, where it could become a problem. Of course it could always be placed in a large pot and enjoyed without any risk of spreading. In a larger garden the gentle spreading ability of this plant is a great bonus, as it will readily occupy a larger area and provide a mass of wonderful color through three seasons of the year. 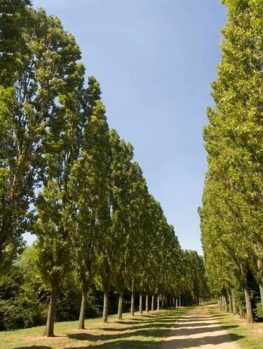 The only care needed is to remove any older stems, or trim back any long branches, to keep your planting fresh and new. As part of the basic structure of your garden, the Tiger Eyes Sumac is unbeatable for the ease with which it adds masses of color and interest for no work from you. This plant has proved very, very popular with gardeners and supplies are limited. So order several now and take care of those empty spaces in your garden right away. Order now and avoid being disappointed and staring at those gaps for another season.